Another spin-off of the Star Trek series, Star Trek: Voyager centers on the Federation starship USS Voyager. 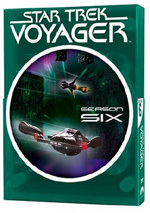 This 7-volume collection includes all 26 episodes from the series' sixth season. Hurray! We’re now in the home stretch for Star Trek: Voyager. We’re now up to Season Six, with only one more year left after it. It’ll be here soon, so I don’t want to waste any time. I’ll cover Season Six’s 26 programs. These shows will be discussed in the order broadcast, which is also the way in which they appear on the DVDs. The plot synopses come from http://www.tvtome.com – thanks to them for their good work. Although the first part of “Equinox” worked well, the second segment is less successful. On the positive side, it’s interesting to see Janeway turn into almost an Ahab-style character as she pursues the other starship. However, the show undercuts the psychological dimensions with a simplistic ending. Still, it has more action than usual and mostly seems entertaining. “Instinct” loses points simply because it’s annoying. The three ex-Borgs are bland characters, and we don’t really care about their journey. It’s slightly interesting to see Seven back in her Borg days, but I don’t like the episode much otherwise. Voyager developed Torres as almost the opposite of Next Generation’s Worf. He wanted badly to be an ultra-Klingon and negate his human upbrining, whereas she wants to ignore and expel all parts of her Klingon heritage. I tired of shows related to Klingon beliefs and customs a long time ago, and this show doesn’t change my mind. It’s slow and tedious. Though this episode’s concept seems extremely cutesy, the reality is that it offers an excellent program. It helps that I like the Doctor, and the show makes terrific use of him. It’s clever, funny and exciting, and I consider it to be one of the best Voyager episodes ever. Don’t expect any surprises from “Alice”, a tediously predictable episode. It tips its hand way too early and fails to take us down any unanticipated paths. It’s a dull show. As I’ve noted in other reviews, Trek loves to put its participants in situations that require them to behave uncharacteristically. Few roles are riper for that treatment the ever-logical Tuvok, so here we see him act like a little kid. The story doesn’t go much of anywhere, and it loses points since Neelix becomes Tuvok’s best pal; any show that presents the series’ most annoying character in a prominent part starts out with a few strikes against it. Russ makes the most of his emotional time, though, and not in a ridiculously showy manner. The program lacks much oomph, but it has its moments. As with “Alice”, “Teeth” suffers from a story that lets us on to its secrets too early. However, it compensates with some good action, a commodity often in short supply on Voyager. I’d prefer to see Janeway come up with more intellectual solutions to problems; one of the pleasures of the Original Series revolved around the clever ways Kirk would outsmart the aliens, but Janeway rarely seems to enjoy those kinds of twists. Still, the show is mostly entertaining and enjoyable. That short synopsis simplifies matters a bit too much, but it covers the heart of things. One problem with the show is that it seems to use the wrong character as the one obsessed with the old spacecraft. Chakotay is fascinated by it, whereas it seems more sensible to put Paris in that role; Chakotay just doesn’t feel like the right person for that kind of interest. Perhaps the series’ producers just decided to branch out the character and logic be damned. The experiment doesn’t work. Here we find Seven in full Jim Garrison mode. This creates a moderately intriguing story as she pursues her various theories. Of course, we know how it’ll end, but it’s fun along the way. On one hand, I like being able to see some Starfleet attempts to contact Voyager. 99 percent of the series comes from the Voyager crew’s point of view, so it’s cool to check out what’s happening back home. On the other hand, this story focuses on the ever-annoying Barclay, and that robs it of much power. What could have been a useful examination of a different element just becomes irksome. I got tired of holodeck episodes years ago, and this one feels like it exists for no reason other than to give Janeway a love interest. It doesn’t work, and the show plods along with little point to it. I don’t like this program. Season Six rebounds with this cool episode. It features a very clever concept and manages to avoid a number of pitfalls. Okay, so it doesn’t make a lot of sense, but I think it’s fun anyway. Just as Data helped explore the meaning of humanity on Next Generation, the Doctor serves the same purpose here. He just does it with more humor. Not that the character doesn’t get his moments of depth, and those pop up here in a surprisingly moving episode. This episode presents a mystery, but an only moderately intriguing one. I was curious to see where the journey would end - I just didn’t much enjoy the path it took to get there. The conclusion wasn’t worth the wait in this mediocre show. Didn’t we already see this story back on the Original Series? Of course, that episode didn’t include a cameo from the Rock. That’s not progress. The show doesn’t reveal anything especially new or creative and feels more like an excuse for some wrestling-related promotion. This show comes across as Borg of the Flies. It manages an inventive storyline, though, and takes the crew into some unanticipated tangents. The quaint Irish village of Fair Haven got old back in its eponymous episode, so I can’t say that I cared much for more adventures there. The show did take an interesting twist in that the holo-characters become aware of the oddness of the Voyager crewmembers in their midst. That turn couldn’t overcome the show’s generally annoying quality, though. Shows usually go downhill when they introduce children into the action. 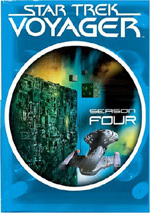 Voyager already had the Naomi character to bounce off of Seven, and now it gives her four more wards. This isn’t a good thing. Add to that an episode that focuses on the lovesick mewling of Harry and “Ashes” isn’t a positive episode. More of Mama Seven pops up here, and the concept doesn’t become any more endearing. At least the program veers into an interesting concept via the method of battling the Borg. This allows the show to end in a strong way, but the preceding parts aren’t terribly interesting. Another show with an intriguing premise, “Shepherd” manages to explore its subject fairly well. Usually it seems that everyone in Starfleet is the best of the best, so it’s interesting to see some misfits. Too bad the program follows the predictable path in regard to their redemption. While many prior episodes presented promising premises but failed in their execution, “Prosper” manages to succeed in both ways. The concept of the fake crew is amusing, and I like the program’s quirky moments, such as the way the phony Tuvok buys into his role. It’s an inventive and enjoyable piece. Due to its emphasis on the usually-annoying Torres, “Muse” doesn’t become a great episode. However, it overcomes a slow start to turn into something surprisingly enjoyable. It presents enough good twists to succeed. When last we saw Kes, she left the ship due to her dangerously escalating mental powers. It’s interesting to see her return, especially in her pissed-off mode. The program follows a number of contortions to become an interesting show. Any chance that DVD Six would offer four good programs evaporated as soon as I saw Barclay on-screen at the start of this show. He doesn’t play a huge role in the show, but just a glimpse of him dooms the proceedings to a degree. At least the interplay between the Doctor and his creator provides some sparks, but they’re not enough to overcome the show’s iffier moments. This might have turned into a decent little ghost story, were it not for the prominent presence of the ever-irritating Neelix. His prominent role undercuts any effective moments that might occur. This renders the story tedious and without much excitement. I thought Seasons Three and Four of Voyager marked real progress after the series got off to a slow start. Season Five demonstrated regression, as it failed to move things along successfully. Season Six bettered the prior year but it didn’t match up with the series’ best sets. It included enough strong shows to maintain my interest, though, and I look forward to the series’ conclusion in Season Seven. 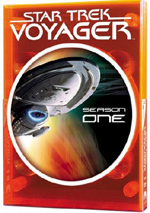 Star Trek: Voyager appears in an aspect ratio of 1.33:1 on these single-sided, double-layered DVDs; due to those dimensions, the image has not been enhanced for 16X9 televisions. No surprises greeted me here, as the visuals strongly resembled those of the prior five packages. All this package’s extras show up on DVD Seven. Most of these come from the five separate featurettes. All use the same format, as they mainly combine show clips and interviews, with a little behind the scenes material as well. We begin with Braving the Unknown: Season Six, a 16-minute and 57-second piece. It includes comments from co-executive producer Brannon Braga, visual effects producer Dan Curry, executive producer Rick Berman, director David Livingston, and actors Roxann Dawson, Kate Mulgrew, Mirina Sirtis, and Dwayne Johnson. They chat about guest star John Savage and elements of the “Equinox” episode, bringing in contact with Earth to the series, Next Generation crossovers, the Rock’s cameo and shooting his fight with Seven, and Torres’ growth in “Barge of the Dead” and some of its challenges. The “Unknown” featurettes can be very good or they can be pretty bland. A lot depends on what happened during the season in question. Unfortunately, we don’t get a lot of good material from Season Six, and this ends up as one of the less interesting featurettes. In One Small Step: A Mars Encounter, we find a nine-minute and 23-second program that alludes to this particular episode. It features information from science consultant Andre Bormanis, actor Robert Picardo, and Planetary Society executive director Louis Friedman. We get a little information about the state of exploratory art but mostly hear about efforts to involve kids in planetary issues. It’s a dull piece. Next come looks at one of the series’ leading characters. Voyager Time Capsule: Chakotay runs for 12 minutes, six seconds. It explores issues connected to the character and the performer. We get remarks from Dawson, Mulgrew, and actors Robert Beltran, Tim Russ, and Ethan Phillips. We hear notes about Beltran’s attitude on the set, his heritage and background, the character and a few specific episodes. This featurette suffers from the absence of any new interviews with Beltran; these programs work best with comments shot after the series’ end. A smattering of decent tidbits emerges, but this comes across as one of the less interesting “Time Capsules”. At least it avoids the spoilers that often mar these pieces. Information about technical elements pops up in Red Alert: Amazing Visual Effects. A companion piece to features seen on the first three sets, the 17-minute and 18-second program presents notes from visual effects supervisor Dan Curry, visual effects supervisor Ronald B. Moore, visual effects artist John Teska and digital effects supervisor Rob Bonchune. They go over the Klingon afterworld and boat in “Barge”, dealing with Kes times two in “Fury”, the ship crash and frozen Enterprise in “Timeless” (from Season Five), the Borg Queen assembly in “Dark Frontier” (from Season Five), the zero gravity in “One Small Step”, set design in “Blink of an Eye”, the Captain Proton parts, and doubling Robert Picardo for “Life Line”. This is a pretty informative piece, as it covers a lot of elements briskly. During the 10-minute and 11-second Guest Star Profile: Vaughn Armstrong, we learn about that performer. We hear from Armstrong, who played 11 different characters across four Trek series. He talks about his convention experiences, his Trek related ditties, and the various roles he played. It’s a good overview of the actor’s parts, though it lacks great detail. Voyager presents some minor Easter Eggs. Referred to as “Lost Transmissions from the Delta Quadrant”, these pop up as slightly hidden icons throughout the “Special Features” screens. We find clips that run between one minute, 34 seconds and three minutes, 11 seconds for a total of 11 minutes, 49 seconds of footage. They offer remarks from Livingston, Mulgrew, Russ, director LeVar Burton, and actor Jeffrey Combs. The clips cover aspects of shooting the Fair Haven bits, Janeway and the holodeck, wearing the Borg makeup, Combs’ experiences on Voyager, and Burton’s directorial work. The clips offer some brief fun but not much of substance. Burton’s discussion of working on the various series provides the most interesting element. 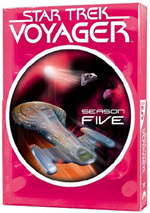 Season Six of Voyager rebounded from the mediocre Five, but not radically so. Some very good episodes appeared among a lot of fairly ordinary ones. The DVD presented picture and sound that were consistently very good. The extras added some decent information, though they didn’t work as well as usual. I wouldn’t want Season Six to be my introduction to Voyager, but it fares strongly enough to make sure it’ll interest fans.